At the 2017 American Institute of Chemical Engineers Annual Meeting, Dr Akpa had a chance to sit down with one of the student leaders from the Minority Affairs Committee Student Leadership Development Initiative. In this interview, Jakari Jackson, a senior undergraduate at Prairie View A&M, shared his thoughts on leadership in his student chapter and his passion for chemical engineering as a tool for navigating the world. Jakari was one of several students who received a Minority Serving Institutions’ Student Travel Grant to attend the annual meeting. Our thanks to the AICHE Annual Fund and Doing a World of Good campaign for supporting this initiative! Dr Akpa was 2017 Chair of the Minority Affairs Committee (MAC) and remains engaged with mentoring and leadership development activities as 2018 Past Chair of MAC. Posted in News on March 5, 2018 by Belinda. Welcoming the new year with a new publication in Biophysical Journal! Congrats to Manuela Ayee on her first author publication in Biophysical Journal! 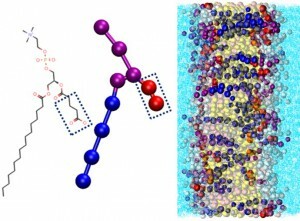 This collaborative effort with the Levitan group employs experimental biophysical and biochemical tools, along with molecular modeling, to explore the influence of oxidized lipid species on membrane structure and the apparent inverse relationship between the mechanics of the lipid bilayer and those of the endothelial cell. Posted in News on January 26, 2017 by Belinda. With an abstract chosen from more than 4,000 submissions, Nick will be hitting the road to present his ongoing research at the 31st Annual National Conference on Undergraduate Research in Memphis (April 6-8, 2017). Congrats to Nick on his abstract acceptance and the award of a travel grant from NC State’s Office of Undergraduate Research! Saturday, Nov 5 will find Animal Science junior Nick Biondo presenting a poster on his molecular simulations at SNCURCS 2016. Nick’s poster, entitled ‘Is lipophilicity a valid predictor of drug sequestration? An investigation in support of lipid resuscitation‘ will be on display from 9:45 to 10:45AM. Congrats from EMRLab to our first pre-VetMed lab member! Posted in News on November 3, 2016 by Belinda. Dr Ayee will be speaking in a session on Biomolecules at Interfaces. Stop by and hear her presentation on Thursday, Nov 17 at 3:15PM or visit her poster at the Meet the Faculty Candidate Session on Sunday, Nov 13. Posted in News on October 23, 2016 by Belinda. If you happen to be at the American Association of Pharmaceutical Scientists meeting next month, stop by and see Matt McDaniel presenting his poster on Monday, Nov 14 at 3PM. His work details our collaborative use of mathematical models to explore responses to lipid emulsion therapy following local anesthetic toxicity in a virtual population. Posted in News on October 6, 2016 by Belinda.